Hrušov Castle is surrounded by shrubs and grasses and is now an impressive ruin of a medieval Gothic castle. Hrušov Castle is located in Slovakia, near the village of the same name in Slovak Hostie County, Zlate Moravce. 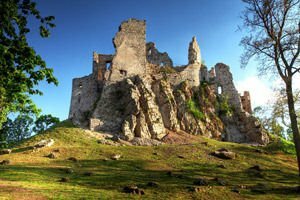 The remains, remind us of the presence of past greatness of this east European castle, standing about 480 meters above sea level. The original castle is dated in 80th year of the 13th century according to historians. The fortification was raised primarily as a defensive structure which aims to monitor and protect a very important medieval road that passed through the Slovak territory. At the time that the castle was erected, Slovakia was part of Hungarian kingdom. It is believed that the Hrušov Castle was built by Mathias Csaky, who in the 13th century was the most powerful and influential amongst the Hungarian nobility. Hrušov Castle most likely was to allow its owner to provide protection and security along the southern borders of the vast territory which they then possessed. Moreover, as one of the most important men in the Hungarian Kingdom Csaky had less enemies. For the first time in historical sources, the medieval castle was mentioned in 1316, described at the time the property is managed by a nobleman till 1369, when he left the castle and it was then successively owned by different influential Hungarians. In the 15th century then its ruler - Koloman of Topolcianky, took on a massive reconstruction and restoration of the castle, which was unavoidable, given the serious damage. These damages were caused by a siege of the castle and remnants of the siege wall were discovered by archaeologists near the castle. It still preserves the original core of the castle of 13th century. In the following centuries a number of improvements occured, but most of the structures d have not survived. In 1624 the castle was owned by the Rakoczi family, whom again renovated mansion. A disastrous end to the integrity of the castle came in 1708 when its construction was destroyed by the Imperial Army.